Busy moms and dads across the country are buzzing about The City Mini Single GT Stroller in an updated style for 2012. Lightweight and foldable for urban convenience, yet rugged enough for agility in the park, the 2012 City Mini Single Stroller GT model kicks everything parents love about the City Mini stroller up a notch. Forever-air wheels? Check. Adjustable handle bar? Yep. Revolutionary brakes, and a folding mechanism with optional auto-lock capabilities? 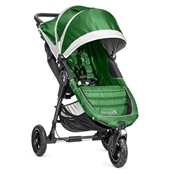 With City Mini’s 2012 single GT stroller, you and your little one can truly have it all. Feeling adventurous? Front wheel suspension and eight-inch foam filled tires on the City Mini GT offer ample shock absorption for jolt-free jogging, while a three position canopy protects your child from the sun during long hikes. Standard forever-air wheels with sealed ball bearings on the City Mini GT avoid adding the stress of a flat tire to your already-hectic life, and our unique handbrake feature means you’ll never have to struggle to find a brake with your foot again. The City Mini GT looks out for your child’s comfort with a near-flat lying position, vented top, and plush-padded seat, and your own comfort with customizable handlebar settings for parents of all different statures. City Mini understands that parents have enough to worry about. Because the last of your concerns should be a bulky or complicated stroller, City Mini has made our 2012 Single GT model the ideal folding stroller for simplifying day-to-day errands and family outings. In addition to its innovative suspension, flat-free tires, and adjustable comfort features, the City Mini Single GT 2012’s folding mechanism is auto-lock-optional and collapses with only one hand. Our innovations are inspired by devoted parents like you. Any way you roll, the lovingly-updated City Mini 2012 is the most convenient folding stroller available for you and the little ones who brighten up your days. CityMiniStrollers.com is Not Affiliated with Baby Jogger LLC.